No more children burned, Don't buy fireworks. 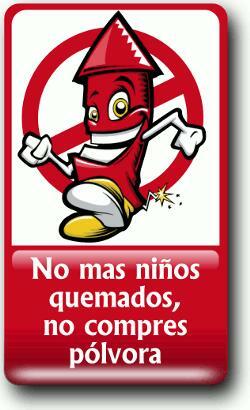 Salvadoran bloggers have been promoting a campaign to stop the sale of fireworks and the resulting burns and injuries to children. Although the government has considered banning fireworks, the popular, but dangerous, tradition continues. Shooting off fireworks is a tradition on Christmas Eve and New Year's Eve. Each year, photos of children and adults injured by fireworks, appear in the press, illustrating the tragedy. Many Salvadoran bloggers have joined the campaign and are displaying the logo at the top of the post. I'm happy to add my name to the list. There is a partial list of participating bloggers at this post by Soy Salvadoreño. It's not just the use of cohetes. Kids work in the homeshop firework factories and die in fires and explosions. You know, my father controlled extremely tightly the amount of fireworks purchased at home, and he particularly banned the explosive type. No burned kids in his home, ever! I support the campaign to NOT PURCHASE POWDER... but I think the people who want to ban so many people's livelihood are just people who know nothing about personal and parental responsibility. Something tells me that El-Visitador did not come from the kind of family that the kids had to help support. I believe fireworks can be bad depending on you use them. I mean is driving is not safe but yet we do it with caution. if the kids would use cation then it could be better how about a campaign for safety? No more Palestinian children in Gaza burnt by the bombs of the Zionist pigs. No more U.S. tax money and F-16s for massacres against the Palestinian people. No more rockets fired indiscriminately at schools, malls, hospitals and civilians. Stop that and the attacks stop. It's simple.